The violence in Kenya is developing into a familiar pattern. 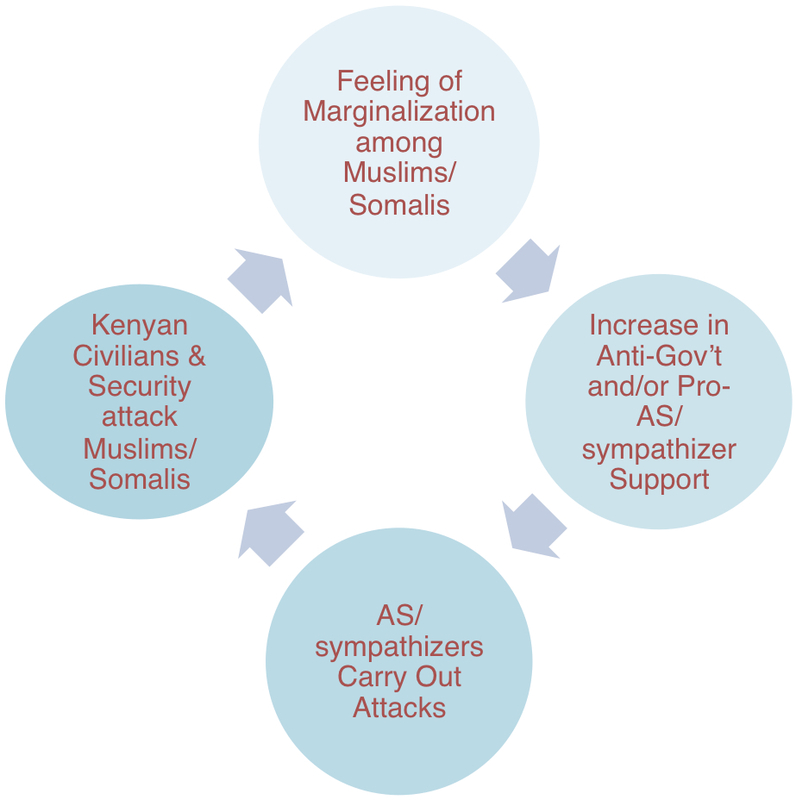 The frequency of al-Shabaab (AS) sympathizer attacks remains steady, but the retaliatory violence by Kenyan security forces and civilians should be of great concern to observers. On 18 November 2012, an improvised explosive device (IED) was set off in a crowded minibus in Nairobi, Kenya, killing nine and injuring thirty people. Many ethnic Kenyans placed blame for the attack on the Somali community—which has been accused of sympathizing or supporting al-Shabaab. During the ensuing riots, Somali shops were looted and roving mobs of both ethnic Kenyans and Somalis attacked each other with slingshots and machetes, which injured dozens with serious injuries. Though Kenyan security forces eventually cordoned off the rival groups, reports indicate that they were responsible for abuses themselves—beating innocent civilians in the streets, harassing citizens with police dogs, and reportedly arresting “hundreds” of Somalis in door-to-door operations to find the attacker. The following day, suspected al-Shabaab militants killed two Kenya Defence Forces (KDF) soldiers while they were repairing a punctured tire in the predominately Somali town of Garissa in northereastern Kenya. After the attack, the KDF and General Service Units (GSU) rampaged through the city burning down businesses in one of the main markets in Garissa and abused many civilians during the operations to find the assailants. A video soon emerged from these operations of the KDF beating individuals who it claimed were al-Shabaab suspects or sympathizers. This shocking abuse reflects the brutality in which Kenyan security forces often have carried out operations–which has helped to create an environment in which al-Shabaab’s propaganda can thrive. Many Somalis (and Kenyan Muslims) already feel marginalized by the Kenyan government, but the continued violence against minority communities will disincentivize communities from working with security forces to capture extremist and criminal elements. It also will increase the pool of disenchanted youth from which al-Shabaab and sympathizer groups recruit. Kenyan Minister of Defence Mohamed Yusuf Haji, who is Somali himself and a Garissa native, will have alot of questions to answer for the behavior of security forces under his portfolio. More broadly, political leaders in Kenya should recognize that the unraveling of the country’s security situation in the months preceding potentially tense elections in March 2013 is not merely a result of al-Shabaab/sympathizer attacks. It is equally a product of the behavior of the Kenyan army and police and the growing tensions between ethnic Somali and non-Somali communities. The Kenya government must make significant reforms to its security sector, such as improving its capacity to handle riots, protests, and “counter-terrorism” operations. It also must hold agents of abuse accountable for their actions. Lastly, it could be useful for the Kenyan government to implement more programs that create common bonds between youths of all backgrounds (e.g., sports, music, and art programs) in order to potentially decrease the scale of youth-led violence after attacks. If nothing is done, Kenya may experience an augmented and more complex level of violence than that which occurred after elections in 2007-2008.